To me, Seb has gone through it all when he was developing for Flash years ago. Things like building 3D in a 2D environment, optimising methods and getting to know the faking techniques and tricks to make something appear awesome without turning your computer in to a smouldering wreck after the CPU melted the thing to the ground! In my humble opinion, the "open web" community are now going through the same process with canvas and other HTML5-esque technologies. So why not learn from what Seb and others have already been through? This is why I wanted to attend Seb's workshop, and if he runs it again, I'd recommend you do the same if you're not familiar with visual programming techniques. 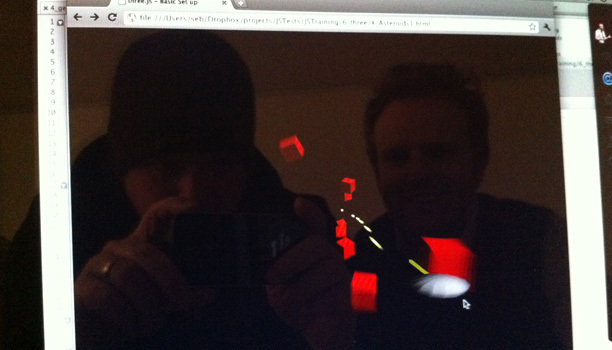 The two day workshop broke in to segments around drawing, vectors, particles, simple 3D and using Three.js. When using beginPath, unless you do moveTo the first use of lineTo will actually move, and not draw a line, i.e. if you do a lineTo without a start, it only moves (in fact because there's no starting point). Rotating a canvas rotates around the origin, which by default is top, left. To move the origin of the canvas, use translate. save/restore state the drawing style and affects coordinate system - this useful for rotating the canvas drawing, and then resetting the rotation. When removing an item (or deleted) - like bullets or asteroids, recycle the item: disable it when it's finished with, and add it to an array. Then when you want a new object, try to get it from the pool of spares first, otherwise create a new item. Instead of having the keyboard interactivity interrupt the code and update values, track the key presses and check these in the render cycle process. (Math.random() * 0xff) <<16 generates a random blue colour (0xff == 0x0000ff == blue), then shift 16 bits and we've now got a random red colour. We could equally get a random green using <<8. When placing objects at a random position, if you use x = Math.random() * width (and similarly with y axis) the distribution creates a square shape, which looks odd. This is easy to fix, you create a circular distribution.